The way in which people interact with each other, different departments and the systems which connect these people both in a passive and active setting determines the most effective and efficient manner in which to lay out the office space. 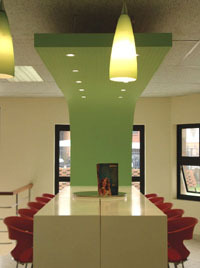 Space planners need to consider all aspects of the office dynamic which includes the reception areas, spaces to hold meetings both formal and informal, support staff office spaces in relation to the flow of information and documentation between departments as well as informal rest areas. The purpose of the business and the image needs to be effectively communicated to clients and staff the very second they enter the space and carried through to every office and department. The culture and corporate identity need to flow throughout the space, communicating the purpose to all involved. The selection and combination of of colour and lighting, the materials and finishes used in the different departments needs to inspire, motivate and reflect the companies identity. The combination of all of these aspects into the space planning concept and implementation through to the finished space is designed to create environments that are optimal to the correct functioning of each department. Seemingly small issues like the placement of office equipment or the use of lighting can go a long way to alleviating stress in the workplace. Correctly laid out and designed offices have a tremendously positive effect on the people who work in these environments by reducing stress, inspiring creativity and a good work ethic, facilitate the efficient flow of information and documentation as well as providing an environment where the employees feel an affinity with the overall purpose and identity of the company. A well designed and lighted office is a productive and inspiring workplace.